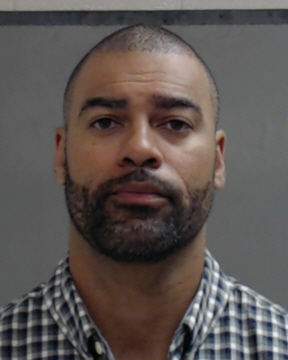 A former NFL wide receiver and local high school assistant football coach was arrested last week on a drug possession charge. Henry Jamaar Taylor, 37, was arrested July 3 on a possession of marijuana of 2 ounces or less charge, according to Hidalgo County jail records. He could face up to 180 days in jail and up to a $2,000 fine on the class B misdemeanor. The former Mission High School player and New York Giants wide receiver is a recent hire as an assistant coach at Robert R. Vela High School under head coach John Campbell. Taylor previously worked as an assistant coach at Pharr-San Juan-Alamo High School. Taylor’s arrest stems from a May 2 incident in which Hidalgo County Sheriff’s Office deputies were dispatched to his father’s house on Tangerine Drive in Mission shortly before 7 a.m. after a man was seen entering the house with a gun, according to the probable cause affidavit. It is unclear from the affidavit who called the deputies, but Taylor’s father “was across the street” at the time. Deputies found two green marijuana plants growing under a light in one of the house’s bedrooms, which Taylor’s father said belonged to his son, who he described to sheriff’s investigators in a June 25 voluntary statement as a “marijuana user” who stayed in the house. No attorney was present at Taylor’s July 3 arraignment, according to Justice of the Peace Jason Peña’s staff. Peña set Taylor’s personal recognizance bond at $2,500 and he was released from jail later that day. The Edinburg school district could not be reached for comment as its staff is currently on summer break until July 18. The Vela high school athletics program has had previous run-ins with the law, with Campbell being arrested Jan. 20 on a DWI class A misdemeanor charge. The district reinstated Campbell as head coach following a two-week suspension, and he is scheduled to appear in court for a status hearing next month, having pleaded not guilty to the charge at a late June hearing, according to court records.